Choose Your Words Carefully Mom They Last Forever! 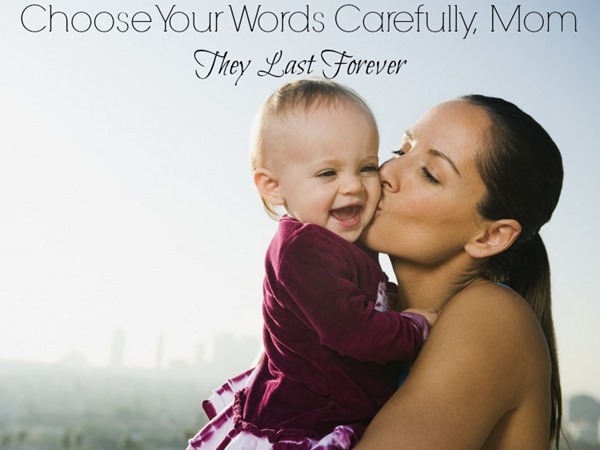 You are here: Home / Family Living / Parenting / Choose Your Words Carefully Mom They Last Forever! Do we as Moms know how much power our words wield with our kids? We need to remember to choose our words carefully because they DO last forever. I mean think about it, the words your Mother spoke to you as a kid, teen, young adult, and even now ring in your ears. We often make decisions today based on what we were told by our Moms as children. We don’t realize even the little things “stick” in our kid’s heads, whether they are 2 or full grown with families of their own. I was talking with a group of women last night about this. One of the women was in her 30’s and moved here from another country 9 months ago. She was telling us that she had been stressing herself out over a failure she had encountered because she didn’t want her Mother to be disappointed. She knew her Mother would tell her that she must do better and that was making her afraid to even tell her Mother she had failed. I thought about the statement we all heard as kids and how it formed my view of food. I was always told to clean my plate. I always cleaned my plate, even when I was over 100 lbs overweight I was cleaning ALL of my plates! lol But, that was a problem. It’s still hard for me to walk away from food on my plate, but, I have taught myself to stop when I am comfortably full. I remember eating until my stomach hurt and I would be in pain for hours afterward. Of course, my lack of self control was the biggest factor in my weight gain, not my Mother’s words, but they are a factor. My kids are grown now, I can’t imagine the things I might have said in haste or without thinking that affect them today, as adults. I can tell you I had one child who always equated the words “That was dumb.” with the words “You are dumb.” If I said something he did was dumb or stupid, he felt I thought HE was dumb or stupid. We often discussed the difference, but to him, it was me calling him that. Today, after they have all grown up, I am much more careful choosing my words when talking to them about their adult lives, spouses, and children. It’s their turn to live their lives, so I try and remember they will do things differently and that’s ok. But, I don’t want my words ringing in their ears to be a negative thing for them. I only wish I had learned this lesson earlier… Choose your words wisely, especially when speaking to your children. Even when it seems like they aren’t hearing you, they are taking in everything you are saying and it sticks. What words from your Mother still form your actions today?